Global Fenugreek Seed Extract Market size was worth over USD 3.5 million in 2016 and will surpass 470 tons by 2024. Changing dietary patterns coupled with rising athletes demand for health supplements will drive global fenugreek seed extract market size. Increasing prevalence of diabetes, particularly type 2, owing to a busy lifestyle, obesity, as well as growing energy-rich foods and nutrient-dense foods consumption, will propel product penetration over the forecast period. Increasing spending on personal care products is also expected to boost the application scope. Rapid expansion of cosmetics market and availability through various channels including online portals, retail, and branded stores will further propel fenugreek seed extract market size. As per industry estimates, the global cosmetics industry was estimated at USD 240 billion in 2016 with sales growth around 4% from the preceding year. Rise in concern about ingredients and chemicals used in the cosmetics will positively influence industry growth. Factors such as antimicrobial and antioxidant properties coupled with improved demand for natural products will propel fenugreek seed extract market size. Growing consumer awareness about synthetic chemicals will continue to boost the natural personal care industry. Manufacturers are anticipated to invest in modern technologies to improve extraction process and overall productivity. Increasing fenugreek production and export across the globe is expected to propel fenugreek seed extract market growth. Major importing nations such as UAE, Yemen Arab Republic (YAE), South Africa, Japan, UK, Egypt, U.S., Saudi Arabia, Bangladesh, Germany, France, Malaysia, Netherlands, and Nepal will provide lucrative opportunities for industry players to gain competitive advantage. However, overconsumption leads to side effects such as thyroid dysfunctions, hypoglycemia, loose motions and breathing problems. This may hinder fenugreek seed extract market growth over the forecast period. Pharmaceutical application was valued at over USD 2 million in 2016. 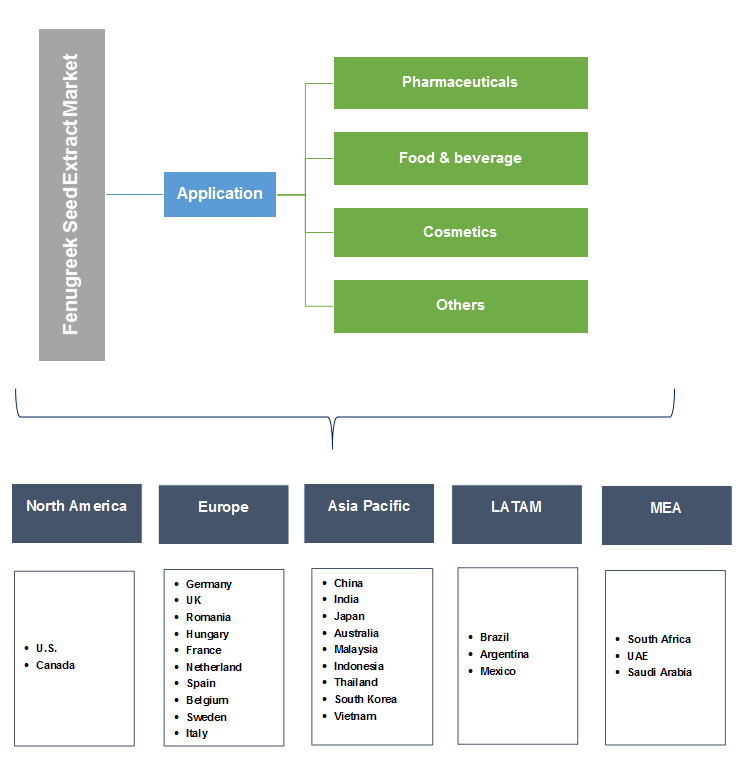 Improved demand for sports supplements to enhance athlete performance and weight management is likely to propel product demand for this application segment. Growing demand for medicines based on natural ingredients, driving research and development initiatives by various manufacturers and researchers. In addition, increasing ayurvedic medicinal formulations consumption augmenting product demand. Food & beverage application accounted for over 40% market share in 2016. Increasing product application as a spice to add a distinct flavor in food pastes, curry powders, and sauces will drive fenugreek seed extract market size from this segment. Rising demand for ingredients extracted from plants, containing powerful antioxidants will further boost industry growth. Cosmetic applications will witness growth over 13.5% up to 2024. High dietary fiber content and other key elements such as iron, manganese, potassium, selenium driving fenugreek seed extract usage in various cosmetic products include shampoo, oil serum, conditioners and anti-aging creams. Further, increasing demand for sun creams to avoid exposure to ultraviolet radiation is expected to propel the product demand. North America market is expected to surpass over 70 tons by 2024. Increasing requirement for vitamins & dietary supplements in the region will support industry growth. Factors such as increasing consumer awareness regarding health and wellness, aging population, new product launches and improved accessibility will propel fenugreek seed extract market size. Europe market is likely to observe gains over 12.5% up to 2024. Rise in consumer expenditure on pharmaceutical and personal care products will augment overall market size. European Food Safety Authority (EFSA) guidelines approved fenugreek seed extract as appropriate for consumers. Rising research and development initiatives between food manufacturers and health organization for diabetes treatment fostering regional demand. Asia Pacific market was valued at USD 1.4 million in 2016. Demand for skin care products based on herbal and natural ingredient products are gaining momentum in the region. Fenugreek producers are majorly concentrated in India. Countries such as US, China, Malaysia, Germany, UK, the United Arab Emirates (UAE), Bangladesh, Singapore, Sri Lanka, Netherlands, Indonesia, Saudi Arabia, Nepal, and Brazil are major importing markets. These factors are likely to propel regional growth. Prominent players in fenugreek seed extract market are Arjuna Natural Extracts, Nutra Green Biotechnology, Ambe Phytoextracts, Unique Organics, Indus Biotech, Bio-Botanica, Hunan nature biotechnology, Chereso Lifesciences, Novoherb and Creative Enzymes. Manufacturers are expected to improve their distribution channels for shorter supply chain. The industry is expected to witness collaboration between exporters and manufacturers in producing companies, skipping middleman in the chain. Increasing scientific R&D initiatives by various food organizations in close cooperation with industry participants is anticipated to propel fenugreek seed extract market expansion over the projected timeframe. Fenugreek seed extract is derived from fenugreek plant and globally, the demand for product as an herb & spice is increasing. The industry is at nascent stage and most of global supply dependent on Asian countries. It's application gaining momentum as a key ingredient in pharmaceuticals owing to high quality medical and herbal characteristics. Therefore, manufacturing firms are likely to upgrade their production facilities and processing techniques to gain a major industry share. Key industry participants are anticipated to integrate business operation including cultivation, processing, and distribution.